Hey readers! I am going to be starting a weekly blog post for the Buzzworthy about how to make home-cooked meals while on a college student budget. 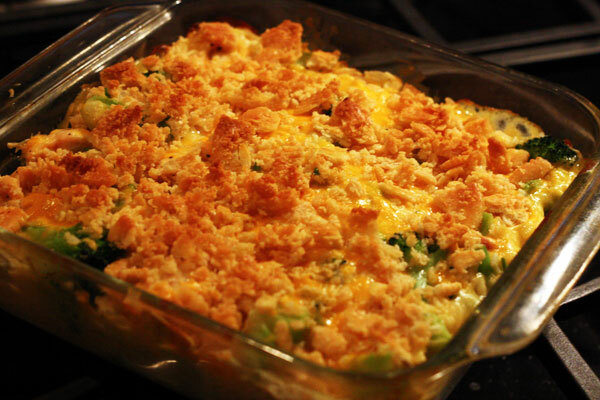 This week I am starting out with one of my favorite recipes: Cheesy Chicken, Broccoli and Rice Casserole. It’s the perfect meal for a cold night and it’s really simple. To start off, you can just go to Walmart or your favorite grocery store and buy a rotisserie chicken (which is a lot easier than buying raw chicken which is more expensive). Also to save money, you can buy the frozen broccoli florets instead of fresh ones. Preheat oven to 350 degrees. Combine all ingredients into a greased 9×13 baking dish. I use a 9×13 because we like extra room for our corn flakes (more crunch! ), but this recipe will fit into an 8×8 or 9×9 baking dish. Mix up all the ingredients except corn flakes and butter right in the baking dish. Sprinkle the crushed corn flakes over the top of the casserole. Bake for 30-35 minutes or until casserole is heated through. So simple and so delicious! Bon appetit! A warm and wonderful meal The golden colors of orange are superb! Great recipe too!